Project Viewer Lite is a simple to use viewer for Microsoft Project files directed at staff and project stakeholders who need to view and be informed about project progress throughout the project's life cycle. The project viewer can be utilized in project reviews, progress tracking, as well as initiate change requests, and/or other actions that have bearing on the project, whilst preserving the project integrity and full retention of control by the Project Manager. Using configurable views the Project Viewer Lite allows maintenance of common look of the displayed data for all project stakeholders and staff involved. The Project Viewer Lite has been designed for speed and ease of use. Its resemblance to MS Project paves the way to a wealth of applicable information and applicable tutorials that are widely available. The Viewer retains its traditional Windows user interface as it offers direct and unimpeded access to and use of all available commands. Also it is completely free! Improved viewing compatability with MS Project 2016. Bug fixes. Project Viewer, Project Viewer Lite, Microsoft Project, Project Management, Project Reviews and Tracking, MS Project Viewer, Project Reader Project Viewer Lite for Microsoft Project 2003 - 2016 files. 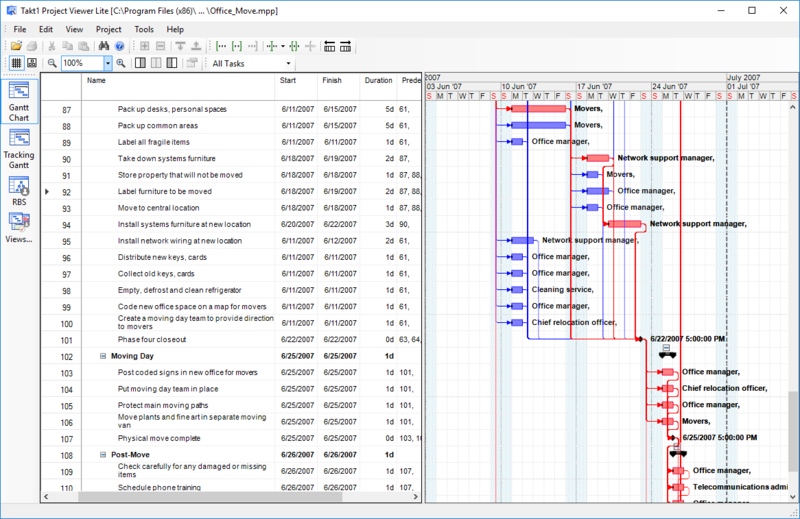 Free project viewer for Windows desktop with configurable Gantt charts and Resources views for project stakeholders and staff, who need to be informed throughout the project's life cycle.